The reservation module has four levels of reservation. The highest level is for Clients (Agents or Tour Operators) to whom the guests belong. In the client level, users specify the client arrival and departure dates, number of rooms, and number of guests (pax). The system assigns reservation number and date that are used by all other levels of reservation. The second level is the level of room type. The users assign different room types along with arrival and departure dates, number of rooms, and number of guests (pax) for each room type. The system automatically assigns available rooms within the period specified for each type. The room reservation is the third level of reservation. The user may change the assigned rooms with the guide of a form displaying all the available rooms for the specified type for the specified period. The fourth level is the guest reservation. In this level, users assign guests to each reserved room. The first guest is considered the principal guest to whom the bill is issued. The users can change the principal guest if room has more than one guest. After completing the reservation to the fourth level, the user can check in all guests defined when the status becomes ‘On Arrival”. The users also can check out all guests and rooms of status “On Departure”. 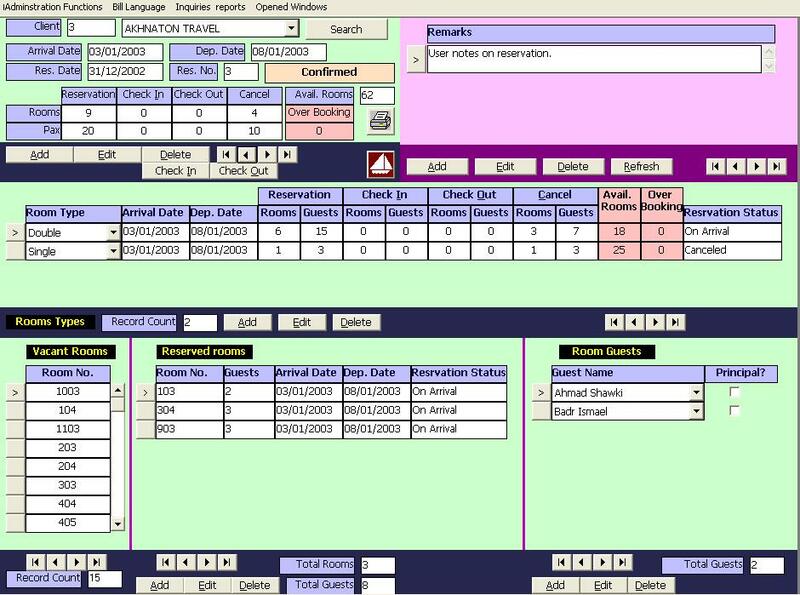 On check out, the system prints a client bill along with a bill for each room. The system also prints a reservation list on request and sends email to client. Users can transfer focus to different forms displayed by pressing F5. The current form has different color (violet) of the bottom bar. The current form is one accessible to the users. The bottom bar of the other form has a black color. GAS General Accounting System and database is required for the definition of accounts used by the module like Client Account, Bank account, Cash Book Account. HBD Hotel Basic Data Module is required for the definition of room types, rooms, taxes and other basic data.